AmeriCorps members Derek Ruszkowski, Tameka Newman, Jalisa Holifield, and Paige Buschman serve during AmeriCorps Week. AmeriCorps Week is a celebration and acknowledgement of the impact AmeriCorps members have on their communities. Stevenson Center AmeriCorps members marked the occasion by helping local scouts with the annual Pinewood Derby. The AmeriCorps pledge to “get things done for America” has fueled 25 years of service with 75,000 members serving 21,600 locations each year and over one million alumni. Corps members choose among three broad programs: National Civilian Community Corps, State and National, or Volunteers In Service to America (VISTA). Each program offers a variety of capacity building and direct service opportunities with nonprofits, schools, and community and faith-based organizations across the United States. AmeriCorps members have devoted more than 59 million hours to their neighbors just in Illinois, resulting in a statewide economic impact of more than $1.4 billion. Members from Illinois State University, a recognized AmeriSchool and an Illinois Justice Corps member, celebrated AmeriCorps Week 2019 with a service project for the W.D. Boyce Council, Boy Scouts of America. W.D. Boyce Council serves over 19,000 active members in 14 counties of Central Illinois. Scouting is a tradition dating back to the early 1900s as a way to educate children through outdoor activities, fellowship, and a code of conduct for everyday living. 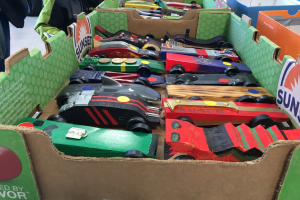 Since the 1950s, the Pinewood Derby has been one of the most memorable events for Cub Scouts. The scouts, with the help of adults, build gravity-powered miniature wooden cars to race down a regulation track. The scouts who participate in this event learn technical and interpersonal skills, in addition to having a good time with family and friends. 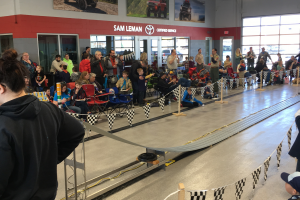 Scouts are expected to carve and assemble their cars before race day and to practice good sporting behavior during and after the event. Miniature wooden race cars that W.D. Boyce Council Cub Scouts created for the race. “This year is the busiest race so far with 54 scouts participating,” Greg Neuhaus, a district coordinator, said. “Last year there were only 40.” The race brings out crowds of 100 to 150 supportive family members and friends. 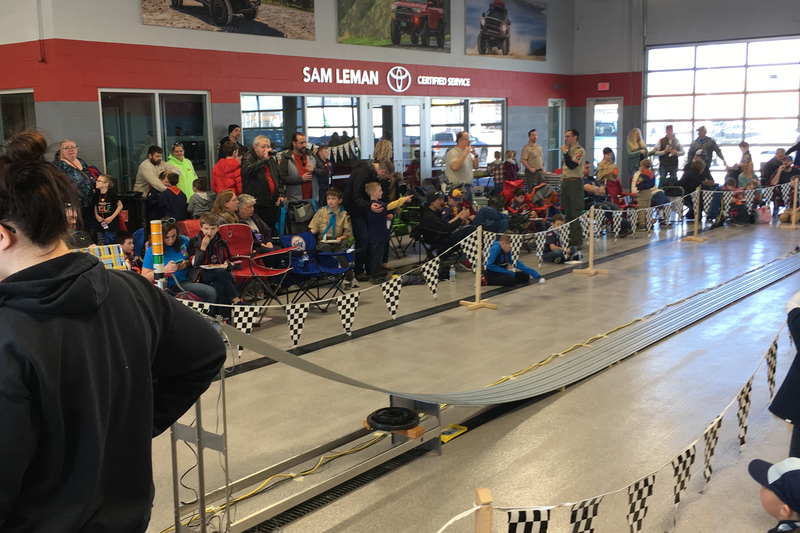 During the Pinewood Derby, held March 16 at Sam Leman Toyota in Bloomington, AmeriCorps members Paige Buschman, Jalisa Holifield, Tameka Newman, and Derek Ruszkowski registered participants, answered questions, and managed refreshments. One lucky member was selected as the “picker” and had the honor of placing the custom cars on the racetrack at the start of each race. All members enjoyed the event and were happy to help the W.D. Boyce Council. The Stevenson Center welcomes former AmeriCorps members to its Applied Community and Economic Development (ACED) Fellows Program. Service with AmeriCorps counts toward the requirement to have at least one year (1,700 hours) of full-time experience in community development or social services (as either a paid professional or a volunteer) or the equivalent prior to the start of classes. The Stevenson Center has a partnership that allows some of current students to serve as AmeriCorps members during their year on campus and/or their second-year placement. Stevenson Center AmeriCorps members have received education awards totaling over $240,000. Jalisa Holifield is an AmeriCorps member and an ACED Fellow in sociology with the Stevenson Center. Prior to beginning her master’s at Illinois State, she served with two AmeriCorps programs, Public Allies and VISTA.